Change the way you make traditional turtle candies with caramel, chocolate, and pecans, and wrap them up as edible gifts. 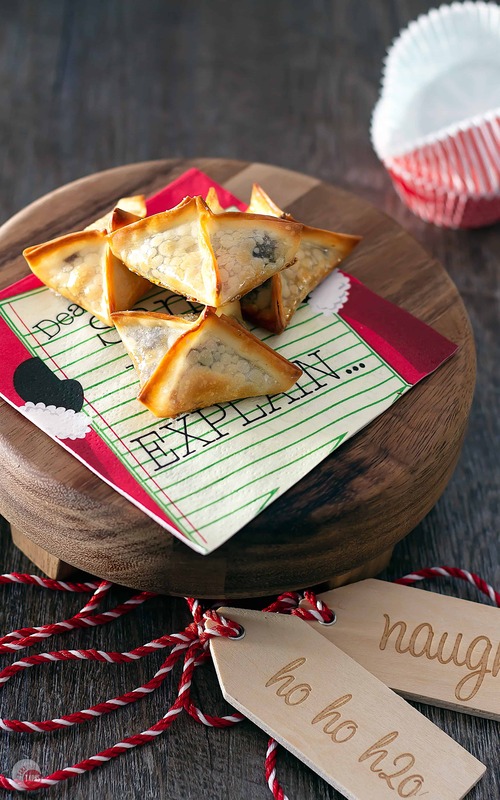 These Turtle Wonton Kisses are the perfect way to spread joy and share the holidays! Can I just say that baking cookies has me in the holiday spirit full swing! I get so excited walking through the grocery store this time of year and looking at the sweet treats that are out. Looking at all the baking items that the store highlights in the aisles kicks my brain into high gear and gets my creative juices running. With so many cookie flavors to choose from, I still resort back to my favorite combination of dark chocolate and caramel. On a recent trip, I stumbled upon a new snack in the airport and immediately got addicted to them. These “mini turtles” made with tiny salty pretzels, held together with buttery caramel and topped with dark chocolate really made my soul sing. I can’t stop eating them!!! These are what I wanted to recreate in a cookie for the holidays just with pecans instead of pretzels. Just take me to the recipe for the Turtle Wonton Cookies already! If you’d rather skip my (very helpful, I think) tips and tricks, essential cooking info, and similar recipe ideas – and get straight to this delicious easy Turtle Wonton Cookies recipe – simply scroll to the bottom of the page where you can find the printable recipe card. The original turtles are easy to make, especially with the help of prepackaged caramels, and only need 3 ingredients. Pecans, caramel, and chocolate. Melted caramel, poured over a few toasted pecans, and then drizzled or topped with milk chocolate stick together for a delicious treat. 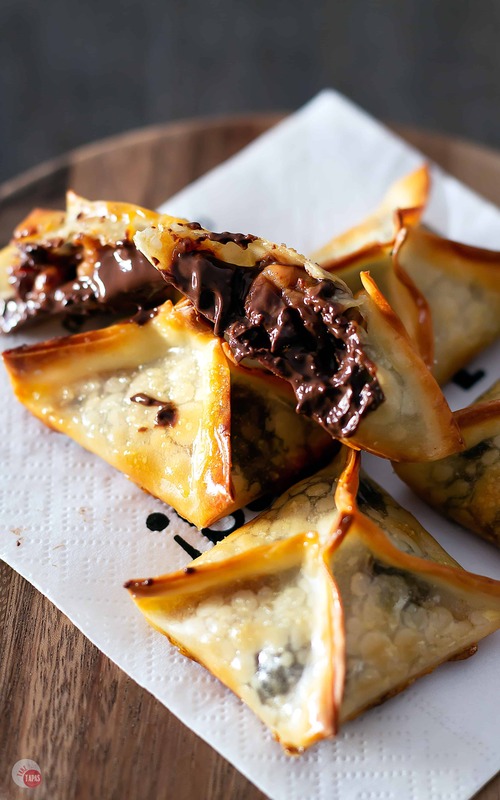 These Turtle Wonton Kisses are all the best parts of turtles, but this time all the goodness is wrapped up in a “package” so you don’t get caramel and chocolate on your fingers while you are scarfing them down! If you are worried about caramels, you can buy the prepackaged squares and cut them into smaller pieces (after you unwrap them of course) or you can use these amazing caramel bits!! They came out with these a few years ago and make life so much easier to use. No unwrapping and they are shaped like chocolate chips, and just a chewy and buttery as their larger candy sisters. 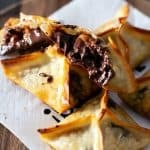 You can make this recipe with pie crust as Dan did in the original recipe, but I prefer the crunch of the baked wonton wrappers. They are super thin and already cut to size. What could be easier than that? A quick brush with egg wash and they take on a crispy outside with a shiny golden crust! Once a quarter, a group of bloggers get together and do a Freaky Friday Recipe Exchange. Michaela from An Affair from the Heart started it a few years ago and it is so fun! We are secretly assigned another blogger, and we choose a recipe from their site. 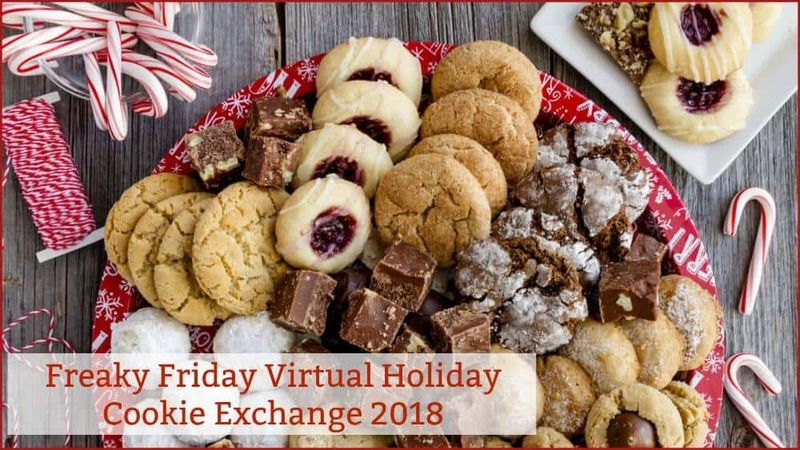 I chose this recipe from Dan and Scott because I wanted to keep in the spirit of a holiday cookie exchange. They are the perfect edible gift to give and receive. I think I ate the entire first batch right out of the oven. I couldn’t help myself. Next, I am trying Dan and Scott’s Cherry Kiss Cookies, Cherry Chocolate Thumbprints, and their Cherry Chocolate Chip Cookies. I am a sucker for all things cherry and they are speaking right to my heart! For last year’s cookie exchange, I made these amazing Cornmeal Biscotti Cookies from Angela at Lemoine Family Kitchen. If you get the chance to make these more savory cookies, you will not be disappointed. Want to see what all the other bloggers are making this round? See if you can guess which recipe they adapted from Take Two Tapas!! If you love this Easy Turtle Wonton Kisses Recipe as much as I do, please write a five-star review, and be sure to help me share on Facebook and Pinterest! On a parchment-lined baking sheet, spread out 12 wonton wrappers. 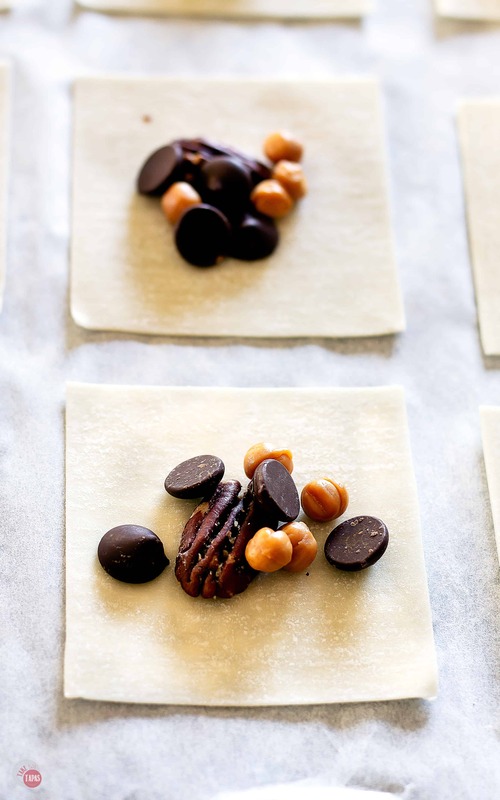 In the center of each one, add 4 caramel bits, 4 dark chocolate chips, and 1 pecan half. 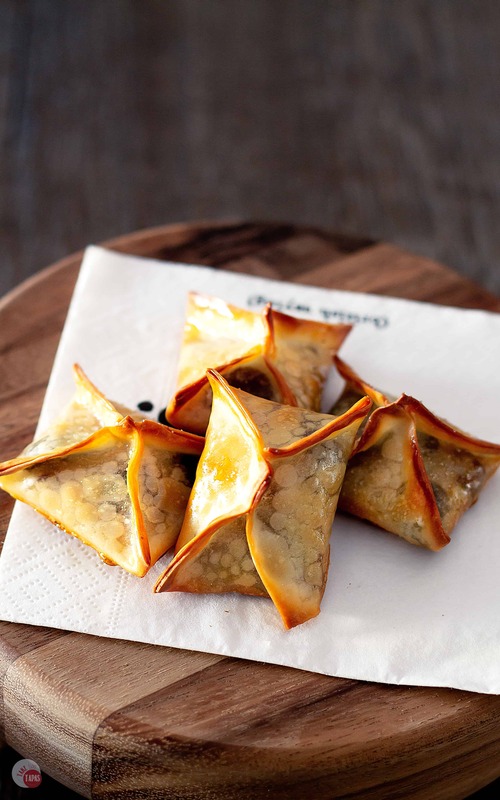 With your finger or a pastry brush, spread a little water on the outer edges of the wonton wrapper. Bring the four edges togeth forming four triangles at the top and pinch to seal the edges. Continue until all wontons are wrapped up. Brush with egg wash and sprinkle with sugar. Bake at 400F for 10 mins, rotating pan half way through. Store in an air-tight container for up to 4 days. The wonton wrappers are BRILLIANT!! The crunch they give it perfect for that gooey middle! These are making an appearance on Christmas Eve! 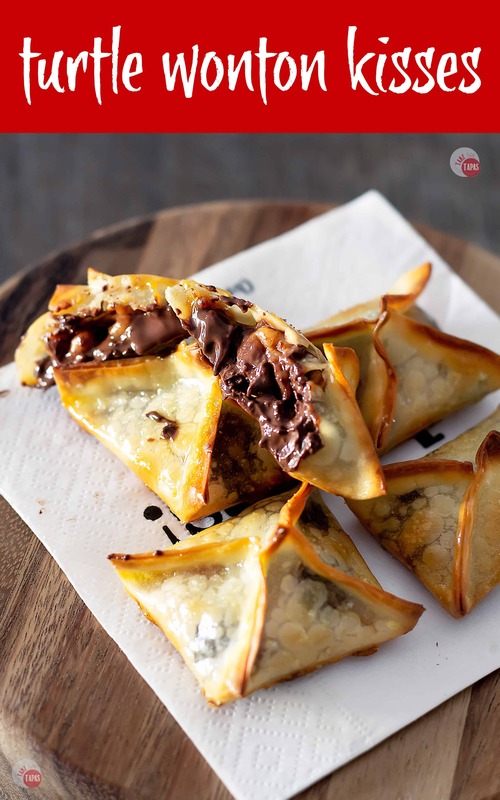 Ohh I definitely love the idea of these wonton kisses! A tasty little nibble like this is perfect for taking to the neighbors as a little gift. These are genius!! I love finding recipes I can make with my boys and this is definitely going to be a huge hit! Turtles are one of my favorites and these in a wonton- YES please!! These are such cute and tasty bites! They’re perfect for the holidays and would be a hit at any party! These look quite spectacular! I can see why you ate the first batch outa the oven. Quality control, right 😉 Hey it’s a tough job, but not a sacrifice with this recipe! What a lovely treat! I need to make a batch of these ASAP! I want one! You sure know how to make a girl drool. That chocolate is just begging for me to devour it! Your little packages look picture perfect and these are so unique that they would be an instant hit! Wowzers this looks amazing! So much fun in a little dessert bite! I have to try this one! Looks so easy and delicious. These are the treats that will do a happy dance in my mouth with all those delicious flavors together. 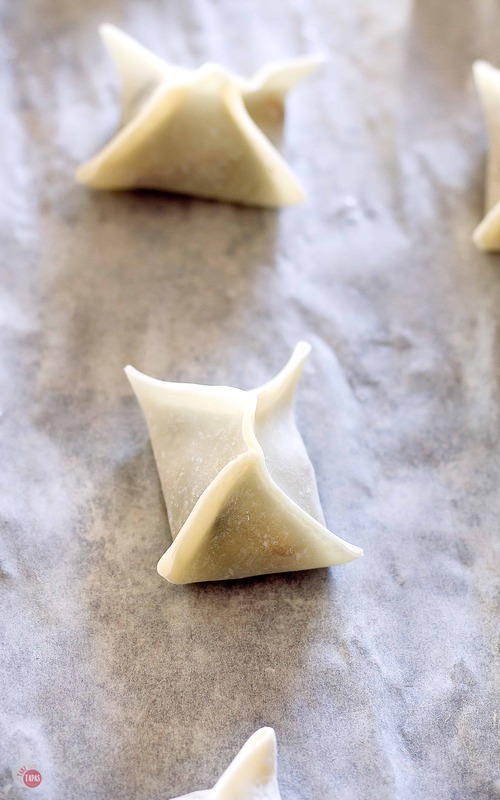 Yay, I have wonton wrappers waiting to be transformed into these pecan wonton kisses! You are so clever in taking such simple ingredients and making them party food. Or food that I can nibble on all day! I will be making this at our Christmas party this year~~. I can almost smell them now… YUMMY! Thanks for taking our recipe and elevating it to a new level. Your version of our wonton kissers looks delicious and addictive; everything a holiday cookie should be. We will be thinking of you this holiday season, with warm kitchen and warm heart, from Wisconsin.